Hungry Sultan Healthy Lunch To Go! 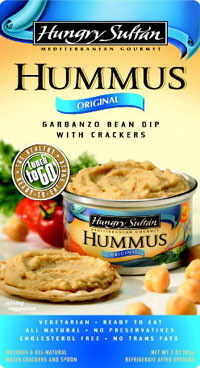 All natural hummus in single-serving cans that seal in freshness are served with Carr's Table Water Crackers making the ideal convenient, healthy and nutritious snack. Greek philosophers wrote about the benefits of hummus in 400 BC. 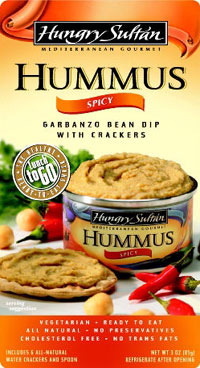 Hummus, or houmous, is a creamy puree of garbanzo beans (also referred to as chickpeas, Bengal grams and Egyptian peas) and tahini (sesame seed paste) seasoned with lemon juice. It is a popular spread and dip in Greece and throughout the Mediterranean, Middle East and India. Garbanzo beans are an excellent source of cholesterol-lowering fiber. It has been noted that garbanzos can increase your energy by helping to replenish your iron stores. And, garbanzos supply significant amounts of folate, and magnesium. And, they are an excellent source of the trace mineral manganese. It is a perfect food for anyone who is concerned about eating well or who is on a low cholesterol diet and doesn't want to sacrifice flavor. 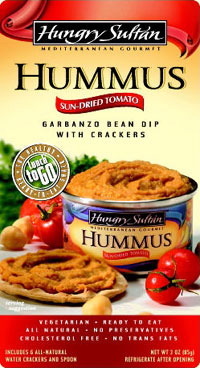 Hummus contains no saturated fat, no trans fat, no cholesterol or sugars. 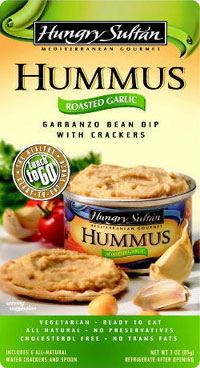 Our Hummus and crackers is a tasty complete protein alternative. No additives or chemical compounds like those found in meats, chicken or tuna. Our Healthy Snack Meals are healthy, nutritious and natural. It is because of the virtuous benefits of hummus that Hungry Sultan offers you it's Healthy Lunches To Go. Copyright © 1996-2006 Hungry Sultan. All rights reserved.